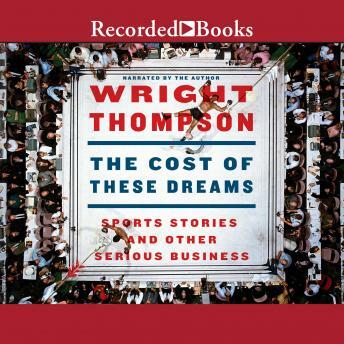 Listen to "The Cost of These Dreams: Sports Stories and Other Serious Business" on your iOS and Android device. From one of America's most beloved sportswriters, a collection of true stories about the dream of greatness and its cost in the world of sports. 'Wright Thompson's stories are so full of rich characters, bad actors, heroes, drama, suffering, courage, conflict, and vivid detail that I sometimes thinks he's working my side of the street - the world of fiction.' - John Grisham There is only one Wright Thompson. He is, as they say, famous if you know who he is: his work includes the most read articles in the history of ESPN (and it's not even close) and has been anthologized in the Best American Sports Writing series ten times, and he counts John Grisham and Richard Ford among his ardent admirers (see back of book). But to say his pieces are about sports, while true as far as it goes, is like saying Larry McMurtry's Lonesome Dove is a book about a cattle drive. Wright Thompson figures people out. He jimmies the lock to the furnaces inside the people he profiles and does an analysis of the fuel that fires their ambition. Whether it be Michael Jordan or Tiger Woods or Pat Riley or Urban Meyer, he strips the away the self-serving myths and fantasies to reveal his characters in full. There are fascinating common denominators: it may not be the case that every single great performer or coach had a complex relationship with his father, but it can sure seem that way. And there is much marvelous local knowledge: about specific sports, and times and places, and people. Ludicrously entertaining and often powerfully moving, The Cost of These Dreams is an ode to the reporter's art, and a celebration of true greatness and the high price that it exacts.